The ibis Mulhouse Île Napoléon hotel is 5 min from the downtown area. 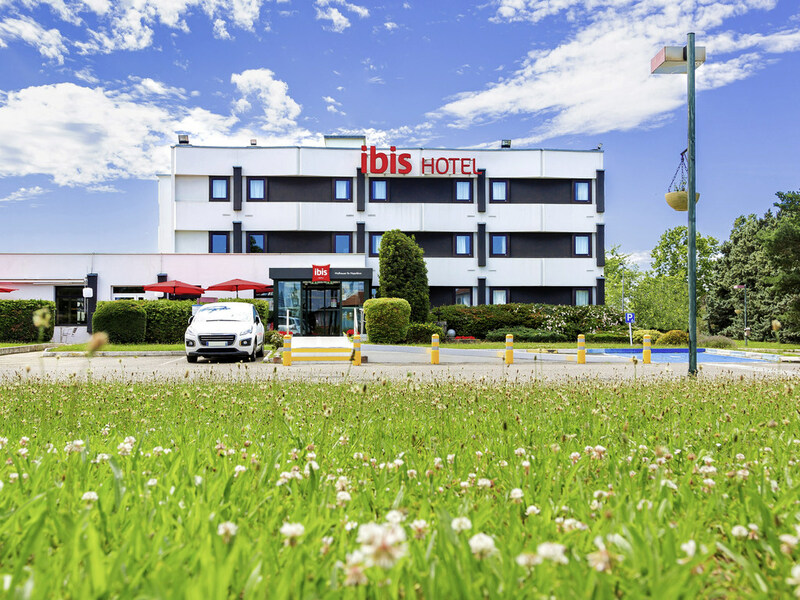 In a peaceful, green setting, the hotel is ideally located on the junction of the A35 highway to Colmar, Strasbourg and Switzerland, and the A36 highway to Lyon. The hotel is 3.7 miles (6 km) from the exhibition center and 15.5 miles (25 km) from Basel-Mulhouse-Freiburg airport. There are 77 fully refurbished, air-conditioned rooms, restaurant, bar, inviting terrace and a free private car park. The Christmas markets are a must-see. Mulhouse has many technology museums: Learn about Schlumpf cars, trains, electricity and printed fabrics, all within 10 minutes of the hotel. Visit the region's tourist areas: the Alsace Wine Route, the Château du Haut-KOENIGSBOURG. For family or sporting breaks, enjoy a number of walking and hiking routes through the Vosges mountains, either on foot or by bike. Enjoy the outdoors with a trip up Ridge Route (Route des Crêtes) or to the zoo and botanical gardens. By car: just 15 minutes from the automotive and railway museums and 20 minutes from the Alsace Ecomuseum and Bioscope. Balcony, air conditioning, 100% no smoking. Treat yourself and join us in the hotel bar at any time of day. I have stayed many times, and the staff are so kind and considerate. Thank you once again for a lovely stay, with the dogs and the cat! It is always a pleasure halfway through our long journey. We got a nice welcome to this quietly located hotel, renovated to the new Ibis style which is attractive. The bed comfort was good, as it usually is at Ibis. Well assorted restaurant in evening, but my entrecote steak was really poor quality meat whereas my wifes was good. Already mold in ceiling above shower; ventilation should be improved. Second time I have used as a budget stop over when coming from Austria or Switzerland and returning to the UK. Staff where friendly and helpful, accommodation clean and comfortable. This time we eat at the restaurant and was pleasantly surprised, better then the nearby restaurant we previously used and a big step up on the last ibis we (regrettably) eat at.Location is close to the major highway so minimal detour. Parking and check in was fine. The meal was lovely but VERY expensive compared to what we’d been used to in Italy. The room was clean and tidy but the gloss paintwork was very much in need of a fresh coat of paint. Absolutely fantastic...the staff from check in to departure were outstanding...100% I would recommend..
Good hotel with sufficient facilities for one or two days. Hotel rooms are clean and equipped with the necessary comfort. Beds are good, staff is friendly and breakfast is fine. Environment makes it only suitable for just a few nights stay. The room was not very clean spiders webs over the ceiling in more than one place. We were told there was a restaurant, it was not a restaurant it was only for bar snacks, warmed up frozen foods mostly, not worth a quarter of the money we paid. Not good on any account. The rooms were clean and comfortable and the staff were extremely helpful. Very enjoyable stay, although only for one night. The room was clean and the bed was so comfy, difficult to get out of! As usual, we stay at an ibis hotel on our way to the south. We have found a double room communicating to the one of our kids, clean, silent and where our dogs were welcome. The employees were all very kind. Breakfast was good, the only thing I would suggest is to have more variety of fresh fruit. Thank you. A stopover on a journey to Italy. The hotel and rooms are clean and well presented. The breakfast was a little limited but of a good quality. Staff were friendly and helpful at all times. I have stayed before and would happily stay again. Have stayed here many times in recent years - very stylish upgrade since I last stayed here; good hotel, friendly staff and comfortable rooms for a one-night stop over. A basic menu for an evening meals but good food and a good selection for breakfast. A decent no-frills stay, as one may expect from IBIS. IBIS Ile Napoleon is conveniently situated half way between Belgium and Italy, and has become one of our regular stops. No luxury but proper service, and a Courtepaille nearby. The quality of sleep is not dependent on the equipment but on the behaviour of the fellow guests.